Some stories and some events that we read about in Holy Qur’an; if we think from just the physical aspect we say, “Okay alhamdulillah that happened for them but what do I do with that information in my daily life, and in my daily activities?” The malakoot and the heavenly realm of light and the world of Light is timeless. There must be a timeless reality in which there is every relevance for the soul, and my day to day, to achieve and to be dressed by these realities. Means the entirety of the way of faith and the actions of the pilgrimage laid by Sayyidina Ibrahim alayhi‘s salaam. To have a child by Sayyida Hajar and that child to not be accepted. And to have to move away and create a home and a location for Sayyida Hajar or Hagar, depending upon who is pronouncing. And the establishment of the Holy Ka’bah, and the reflection of Divine Reality upon Earth. Means this location was established by Sayyidina Ibrahim alayhi‘s salaam. So understanding of that location, understanding that tawaf, and understanding that reality. Then to be sit in that location, but yet not the Ka’bah there, where he dropped off his wife Sayyida Hajar at that location and said, “I have to go I will be back,”. In her pursuit and desire for thirst as she has a child and they needed water, she goes back and forth, back and forth, the reality of why she goes back and forth seven times, hits the dirt and Zam Zam comes. Zam Zam from the Kawthar. These are the rivers and realities of Paradise which Allah Azza wa Jal wanted to open upon this dunya. Then the life of the child that Sayyidina Ismail (alayhi‘s salaam) is growing up, they say, 10 or 11 or 12 years old. Then now the entirety and reality of Hajj is based on this event because all of Hajj is Arafat. 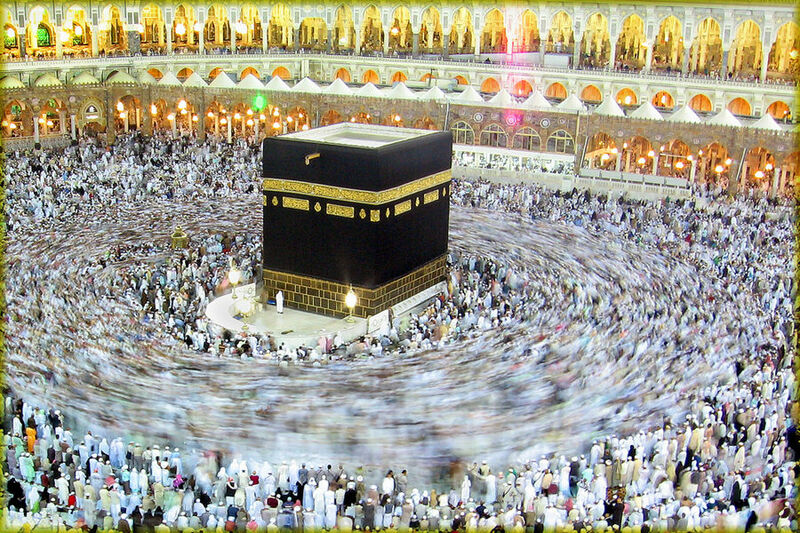 We make tawaf around Ka’bah, why making 7 circumambulations around that reality? Why 7 Paradises, why 7 lataif (subtleties) of the heart. Means every tawaf is for our reality in every Paradise of Allah Azza wa Jal and in between these seven Paradises may be infinite, but we must have a reality in each Paradise. Who knows himself will know his Rabb (Lord). Means when we take a path of realization we begin to reflect inward. Means our journey from our outer form into our inner reality, is the reality of that tawaf. 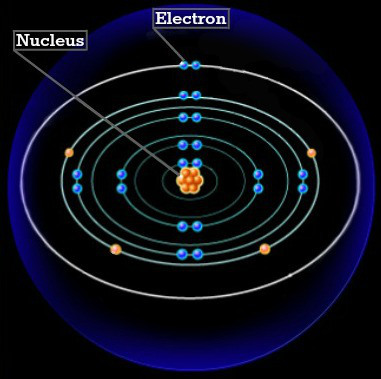 And how to keep moving in Allah’s Way, just like the atom that has seven rings. That we are on the outermost ring trying to make our way towards that nucleus. Means there is a secret in those 7 tawaf. But the child, Sayyidina Ismail alayhi ‘s-salaam (from the story of Hajj), that Sayyidina Ibrahim begins to have a dream that Allah Azza wa Jal says: Ya Ibrahim, you have given everything for Allah (aj), and you are very generous. And this is very important in our life, because we give from our free will. It is nice to give from your free will. You want to give it, it comes to your heart and you give it. There is a lot of ‘ourselves’ in that giving because you determine when you are going to give it. So that comes from our will. [Allah Azza wa Jal] said: you have been generous but what Allah Azza wa Jal is commanding you is We want that which you love dearer than your money and your property. All your life you prayed for that child to be born. That child is born, We want him. [Ibrahim (as)] said: “oh uh, I don’t want to deal with that issue, I don’t want to interfere with that.” Allah Azza wa Jal says: no, no put that on the table. Three times the image came, the dream came that sacrifice Ismail alayhi ‘s-salaam and Sayyidina Ibrahim, no I go to sleep, one, two, three. The third time he knew it is real, Allah Azza wa Jal wants that sacrifice. Immediately he prepares himself, goes to the room to take Sayyidina Ismail alayhi ‘s-salaam to Jabal ar-Rahma on Arafat for the sacrifice. It means that Sayyidina Ibrahim is representing the ‘form’ and the perfection of form, which is why it is the Nabi. Means it is the example for us that we have to perfect our form. Means that is the reality of the moon, when we show the crescent and the star. It is not like this (Shaykh shows crescent with horns upward), these represents the horns of Shaytan. 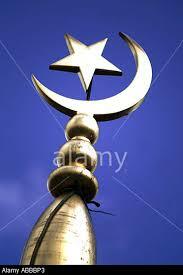 So now everywhere they put these horns of Shaytan and they say this is on top of the masjid. No this two (horns) is for Shaytan. But it is like this [Shaykh shows sideways facing crescent], because there is no moon like that [pointing upward]. 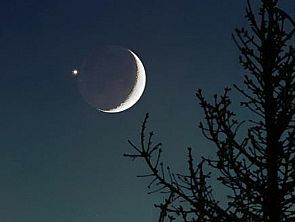 The crescent of the moon like that (sideways) and the star is the perfection of the soul, the noor. Means perfect your body, perfect the soul, something is going to be born from that reality; These are the three realities. Sayyidina Ibrahim represents for us, perfect your form. That is why you follow the Sunnah. You follow the Sunnah of the prophets alayhi ‘s-salaat wa ‘s-salaam because they are the perfection of the form. They give you the Law, they give you the yes, the no, the do, the don’t. When you perfect that then we are understanding the reality that Sayyidina Ibrahim wants for us to understand because the Hajj is the way of iman (faith) and the perfection of imaan. Our journeying 12 months to reach to this 12th month [Dhul Hijja]. The 12th month is the completion. That Sayyidina Ibrahim is describing that these 3 that came to me and 3rd time I acted upon it because there are also 3 locks upon the heart of the believer. The heart of the believer is locked where Allah Azza wa Jal describes that their qalb has a lock upon their ears, has a lock upon their eyes and has a kiswa covering their heart. It means these have to be removed. That is why jamarat has 3 stones, the 3 times that Shaytan is attacking. Means he is waiting 3 times for a confirmation, but the body is struggling to submit to Allah Azza wa Jal. That the order comes and this is a Nabi. Imagine in our lives, when you are given an order by the shaykh or given an order, you have 3 days to complete it. After 3 days it becomes stale, it becomes something that was not what was ordered and the co-ordinance begins to change. Allah Azza wa Jal doesn’t even give 3 days, but the minute he woke up, he didn’t listen. He went back to sleep, again it came, woke up didn’t listen. He went back to sleep, again it came. Third time confirmation in one night, “get out. Do what you have been ordered to do”. Sayyidina Ibrahim gets up and takes his son and begins to go towards the mountain, Jabal ar-Rahma. Shaytan immediately goes to Sayyida Hajar which is representing the wife, which is representing the reality of the soul mate. Your ‘soul’s mate’ means the reality of his soul and her perfection of character. She was purchased, she had no free will. Even she represents that she was a captive, that is a polite word. She was captive, and she was turned into the wife of Sayyidina Ibrahim alayhi‘s salaam, representing means the soul in tasleem, in submission. 3 Attacks of Shaytan on Body, Soul, and…. 1. Shaytan came to the body, tried to block Sayyidina Ibrahim, so 3 times Allah Azza wa Jal had to send isharat (sign), that get up, don’t pass what Allah Azza wa Jal is asking, you are going to be in big trouble. Immediately he gets up and begins to take his son to do what Allah Azza wa Jal has commanded. 2. Then Shaytan goes to the soul, goes to Sayyida Hajar and says, “Do you know what Sayyidina Ibrahim is about to do?” and begins to describe. She said, “You don’t have to describe to me, he is a Nabiullah (Prophet of Allah) and a Rasulullah, (messenger of Allah). Whatever he has been commanded, samina wa a`atana (I heard and obeyed)” that her faith in his belief and in his character made her to tasleem. Means in our daily life that is the battle that we are facing. That my soul wants to believe and my body is constantly struggling. And my soul is telling me that, “I am not going to follow your body, until your body is in submission to Allah Azza wa Jal. You are going to put harm upon me”. And this becomes the perfection of character, this is the whole way of ma’rifa, of gnosticism, of realities,. That in that timeless event, when we are seeing, because the prophet of Allah Azza wa Jal is the best of examples. [Ibrahim (as) saying] that my faith and my character was upright and hanif. And my wife realized that that character is true and whatever Shaytan came to tell her, [she said] I am not listening. If Allah Azza wa Jal has ordered him to do what you say Allah Azza wa Jal has ordered, I am submitting.” This is now the perfection of the soul. That our whole way is that the soul is trying to submit, trying to listen, trying to understand, but doesn’t have confidence in the body. That is why the turuq (Sufi paths) and the way of reality is not meant for the mind. That you don’t hear the Shaykh through the head and say that, “I don’t understand,”. But it is meant to open your heart and allow them into the heart until their Lights begins to enter into the heart. Because when you love somebody they enter into your heart. When you like someone, eh he is okay, it is entered into the (shaykh points to the head). Because you constantly begin to analyze whatever the person is doing or saying, “Is it correct or is it not correct, is it like this or like that,”. 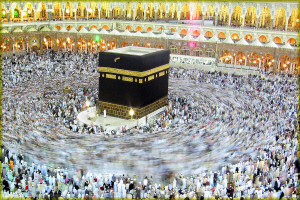 This is where Shaytan is (shaykh points to the head) and all the waswas. This is not where they want the Light of faith to enter. They want the Light of faith to enter within the heart. It means open your heart with ishq and muhabbat. Their light begins to enter into the heart. That is atiullaha wa ati ar-rasul wa ulil amri minkum. 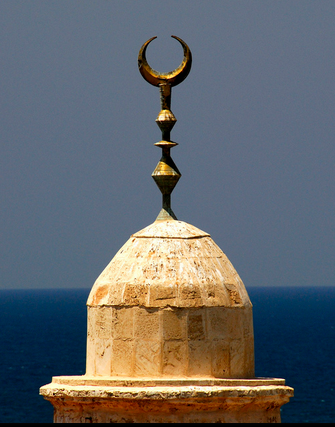 The ulul `amr, the Light of their faith begins to enters into the heart of the believer. The love for them, that Light enters the heart and that Light begins to fight and begins to perfect faith! We don’t have the ability to perfect it ourselves. Qul in kuntum tuhibbunaAllah fattabi`ooni, from the tabi’yeen (the followers). 3:31 Qul in kuntum tuhibbon Allaha fattabi’onee, yuhbibkumUllahu wa yaghfir lakum dhunobakum wallahu Ghaforur Raheem. Allah says if you complete that, I am going to love you. 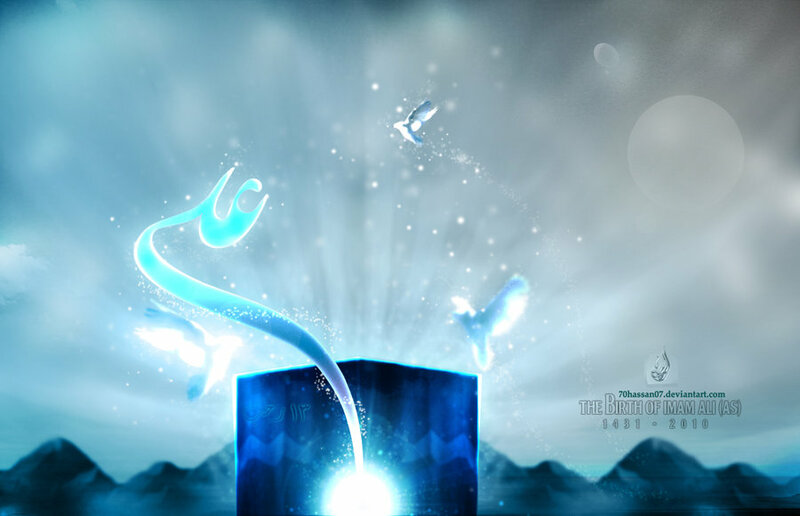 If Allah’s Love comes, that is Nur al-Imaan (light of Faith). It means they come into the heart, not into the head to analyze. The head carries no love. 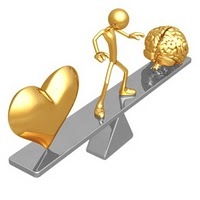 The head carries logic and even good and clear logic, because Shaytan can pirate the head but Shaytan cannot enter into the deep recesses of the heart. If that love becomes true and that love becomes pure, it goes so far deep, it overtakes full control of the authority of the body. But if you bring love into the head it’s not really love. It is going to constantly analyzing them, analyzing them, until Shaytan comes and begins to play with that television and begins to send different frequencies and your head is always confused. The first zikr of all turuq is laa ilaaha illallah, [Shaykh moves head up with the word laa indicating ‘nothing’]. Laa means cut your head, illaaha (moves head to right side of chest) illAllah (moves head towards the heart). It means no head in this way. Head, you leave it for your school, for your education, for your money. The way of imaan is the way of the heart. The concept of the imam is that you must apply someone greater than yourself, more pious than yourself, more honored than yourself as your imam. By having the guide, by having the ulul amr, they are the imam of the family. So that the body understands and the soul understands, that you are of course from what the imam is saying. As soon as they begin to move and adjust themselves, the body is submitting, the soul is submitting, the perfection of that reality comes. And what is now born from men and women who come together in marriage? Is a child. 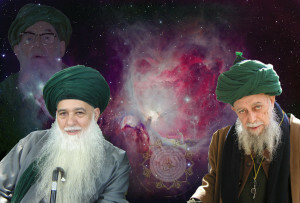 Sayyidna Ismail alayhis salaam is the birth of that reality. That is why the darajat (rank) and the maqam (station) is so high. Means the birth of the the perfection of the physicality, the perfection of the soul, is now the perfection of the futuha. 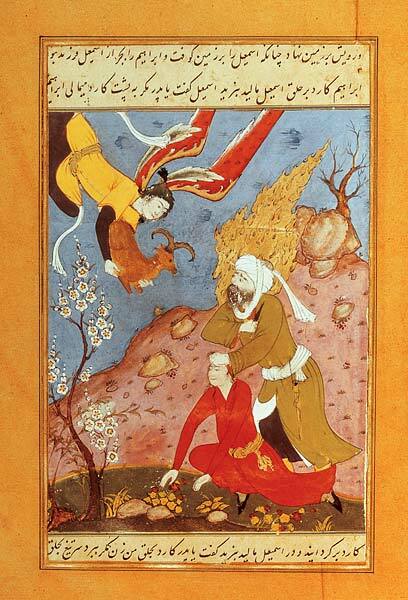 (laa fatah illa `Ali), the futuha is what you call Islamic chivalry. The youthful innocent, that is a perfected innocence. It doesn’t have the dirtiness of an adult, who already made many ghunna, many sins and trying to purify themselves. 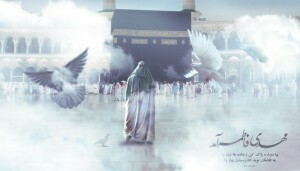 What sets apart Sayyidina `Ali is that from childhood, his perfection of submission, with no ghunna (sin), nothing wrong. His entire life in tasleem and submission, his entire life in the love of Sayyidina Muhammad sallallahu alayhi wa sallam. That is representing Sayyidina Ismail alayhi ‘s-salaam that because my father has perfected his physicality, my mother representing the soul and her submission to his reality, because she is from his rib. Where Prophet sallallahu alayhi wa sallam describes but the ladies don’t like to hear that: If I would have, I would have women to make sajda to their husband, because they come from him. Allah Azza wa Jal created man from His Hand and breathed upon him and from the reality of that insaan, pulled out from the rib, is the reality of Hawa, Eve. But shows the perfection of relationship, that when that physicality is truly submitting and the confidence and the accommodation and the coordinance are correct, the soul is in tasleem. If the soul is in tasleem, Sayyidina Ismail (as) is born. Sayyidina Ismail is in perfection. Maqaam al-Ihsaan, this is the station of firasah in which you pray and you see Allah Azza wa Jal . Stop right there, because they explain that: if you don’t see then Allah sees you. But that is not Sayyidina Ismail alayhi ‘s-salaam. Sayydina Ismail is seeing the Divinely Presence and understanding the order of a prophet of Allah Azza wa Jal, of the six great prophets of Allah (aj). Means you are below the prophet, for you to have isharat (sign) of understanding what is coming to the Prophet sallallahu alayhi wa sallam. It is an example of a tremendous station in the Divinely Presence. That you will find me to be patient with what Allah Azza wa Jal is ordering you, means he knows his own sacrifice is on the table. He knows that he is going to sacrifice himself for this noor Muhammad (saws) that is coming. And that is the azhimat (greatness) of Sayyidina Muhammad sallallahu alayhi wa sallam. 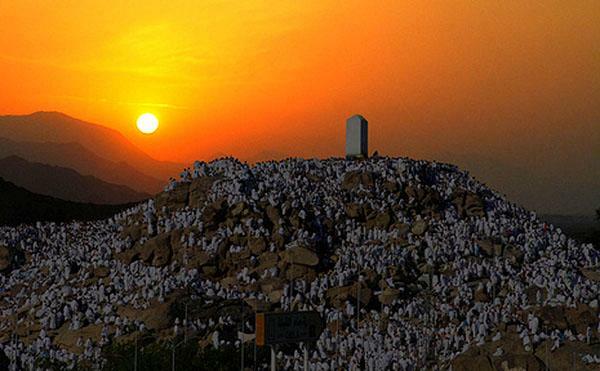 All of Hajj is ‘Arafat. All of ‘Arafat is the reality of Sayyidina Ismail alayhi ‘s-salaam. Yaa Sayyidina Ibrahim, you are going to sacrifice your property and a lot of burning, a lot of intensity, and a lot of fear. But Sayyidina Ismail alayhi ‘s-salaam was sacrificing himself for Allah’s Rida and satisfaction. From that light is the light of Sayyidina Muhammad sallallahu alayhi wa sallam. That is the reality of Sayyidina Muhammad sallallahu alayhi wa sallam. When Prophet sallallahu alayhi wa sallam comes on to this Earth, he is coming from that lineage to describe to us that: I am from those who would sacrifice ourselves for Allah Azza wa Jal. We don’t sacrifice properties and goods, this is not our interest. Our interest is to sacrifice ourselves for what Allah Azza wa Jal wants from us. Now Ahl al-Bayt begin to move in and they begin to teach. You have from 1 to 12 for regular people, for awliyaullah they are moving at a different reality. That twelfth month for awliyaullah is 12 times the reality of 9, because 9 is the sultanat of reality. That is 108 (12×9) and it is Surat al-Kawthar. From that immediately awliyaullah step in and begin to teach the Ahl al-Bayt. That Imam ‘Ali alayhi ‘s-salaam is teaching, every month one of these imams is in charge of that reality. The first one being Muharram being under the authority of Sayyidina `Ali alayhi ‘s-salaam and the 12th month is under the authority of Sayyidina Mahdi alayhi ‘s-salaam. 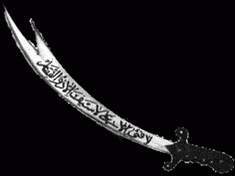 Muhammad al Mahdi (as) is the Muhammadan hadi, most guided soul of the Muhammadan Reality alayhi ‘s-salaam. And why all the prophesied events of Sayyidina Mahdi alayhi ‘s-salaam are initiated by Hajj? It means for the arrival of Sayyidina Mahdi alayhi ‘s-salaam in all the hadith, and all the scholars of hadith will tell you that there will be tremendous battle at the time of Hajj with much bloodshed and many events will have transpired. At that time they will be waiting for Sayyidina Mahdi alayhi ‘s-salaam. Why? Because the 12th month and the reality of the 12th Imam, and the reality of Hajj. All of them are an eternal reality. There is no one shot, it is eternal. It is not a coincidence that Sayyidina Mahdi is in charge of the reality of that tajjali for Hajj. 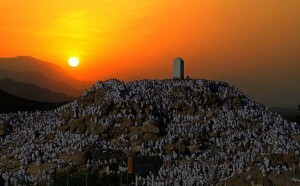 And that Hajj is based on ‘Arafat and ‘Arafat is based on sacrifice, and these are the Ahl al-Kawthar. Bismillah ar-Rahman ar-Raheem. 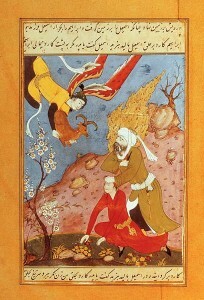 Inna `atayna ka ‘l-kawthar, fasalli li-rabbika wanhar, inna sha’ni aka huwa ‘l-abtar. 108:3 -Inna shani-aka huwal abtar. Means if you want to be dressed by oceans of Kawthar, these are oceans of hayaat; they are the oceans of life, they are oceans of every Divine knowledge. Fasalli rabbika wanhar, that is the Arafat, “That to your Lord, sacrifice.” So means there must be the ruhaniyaat of Sayyidina Mahdi alayhi ‘s-salaam on that Arafat. That the Ahl al-Bayt are present and the Ahl al-Bayt are inspiring within all the souls that are moving to Arafat, that you live a life of sacrifice, sacrifice yourself for Allah Azza wa Jal. Now that is not to be confused with people who blow themselves up. So we have to say for every video because they may watch one video and not watch another video. The way of sacrifice is to sacrifice yourself, your bad characteristics, your wants and your desires. You would never harm someone else, means your only harm is for yourself, that come against yourself, come against what you want, come against your desires. Means everything from what I want yaa Rabbi is not necessary, what is it that You want from me to do, and I reach towards tasleem and submission? and they are the masters of submission. On that ‘Arafat, they begin to describe: if it is Sayyidina Muhammad sallallahu alayhi wa sallam you love and the reality of that Light that you love, take a path of sacrifice. That is why the baab, the gate in which they move is based on 9. The 9th surah is Surat at-Tawbah, has no Bismillah ar-Rahmaan ar-Raheem. They teach us and come into our lives, that every year when it begins, enter into tawbah, where there is no Bismillah ar-Rahmaan ar-Raheem but make yourself to be halal for Allah Azza wa Jal. Put your head on the table and say, “Yaa Rabbi my desires, my wants, my needs are not important,” because it is those same wants and desires that block us from everything. Whatever Allah Azza wa Jal wants from us of submission, we want something else! And this is blocking this tasleem, and submission. And they begin to teach, no, what Sayyidina Ibrahim was bringing, if you want to reach the reality of Sayyidina Ismail. It is represented by submission, it is represented by self sacrifice; that ‘Arafat is the secret of the Light of Sayyidina Muhammad sallallahu alayhi wa sallam coming into dunya. And that Prophet sallallahu alayhi wa sallam’s mission in life was to teach how to annihilate the self, to reach the Divinely Presence and satisfaction of Allah Azza wa Jal. 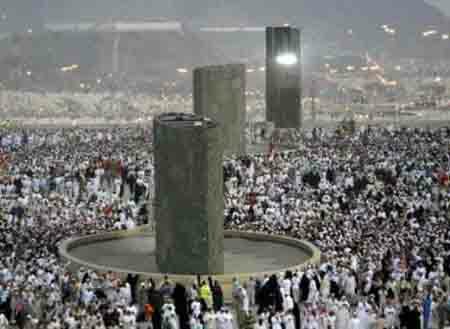 We pray that not only the physical Hajj to be done, but more important is the spiritual Hajj. That Allah Azza wa Jal accept from us and teach us how to bring the physical desire down. How to bring the power of the soul out, so something truly new can be born. That new reality if born is something unimaginable of what it’s been dressed with. Where people see you and don’t don’t recognize you as the one they knew, before because it is an entire new reality that Allah Azza wa Jal dressed the soul from. Subhaana rabbika rabbil izzati `amma yasifoon wa salaamun `alal mursaleen wa ‘l-hamdu illahi rabbil `aalameen. Bi hurmati fatiha.